AF International, leading brand manufacturer of effective cleaning solutions for the Office Products Industry have extended their product range into the area of Specialist Technology Cleaning. Utilising their experience and expertise, the company has developed a range of high tech cleaning products specifically designed for the Personal Protective Equipment sector; the range is easily identifiable by the smart new gunmetal livery. Establishing a regular cleaning regime for the maintenance of PPE equipment (such as safety glasses and hearing defenders) has never been more important, particularly as most PPE equipment is available for shared use in the workplace. Grease and grime can build up very quickly impairing the effectiveness of equipment. To combat this, AF International have developed three key products ideally suited for many industries such as construction, laboratories, education, warehouse and some sporting activities. PPE equipment is a legal requirement in many industries and maintaining good working order is imperative. Storing the equipment in a safe dry place does not, unfortunately, prevent dust and grime build up; prevention via a cleaning regime really is the best solution. Hearing defenders form part of mandatory safety equipment for many industries and shared usage is very common. AF’s EPC Hearing protection cleaning wipes are a re-sealable flat pack of 40 cleaning wipes, impregnated with a safe cleaning solution, designed to remove grease and dirt from ear defender equipment for daily maintenance. Safety glasses are also a key element of mandatory protective equipment with dust and dirt causing visibility issues. Choosing the correct cleaning and maintenance solution can help users to experience the best results from their safety glasses. 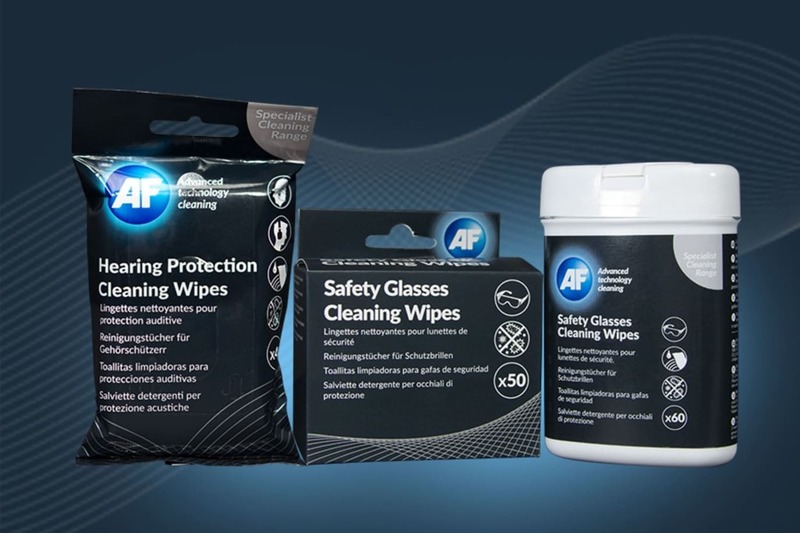 AF’s SGC Safety glasses cleaning wipes are available in handy tub of 60 wipes, impregnated with a smear free cleaning solution. Also available in a box individual of 50 individually packed sachets excellent for communal areas to prompt the use of PPE cleaning.